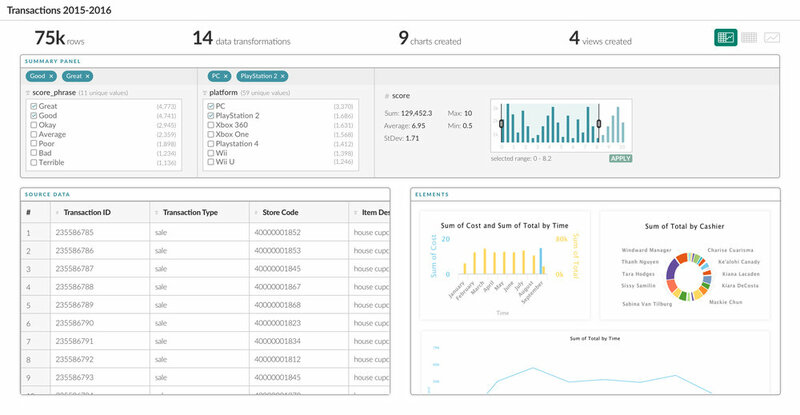 Mammoth was essentially divided in three parts: a data exploration, structuring and cleaning function, a charting function and finally a reporting function. When I joined Mammoth as a contractor the product was suffering from an unintuitive user interface and experience. The 3 core functions of the product needed to be more obviously represented. All 3 functions also needed the full screen real estate to be effectively used. The use of spreadsheets, charts and reports is complicated when used in smaller components. The above design shows one of the suggested interfaces. Clearly presenting the 3 core actions (data, charting/elements and reports) in distinct views. Next to the core actions the UI also showed a clear timeline of actions on the left. One of the core functions of Mammoth was its powerful reporting function. This allowed data scientists to create reports that captured the most essential insights of their data. The reports were designed to be easily shared with the wider team, business or management. Next to doing product design work I was also tasked with redesigning the website experience (desktop and mobile) for Mammoth. At the time the company had a very "classic" SaaS website with a lot of information. The decision was quickly made to simplify the website and create a one-pager that would outline the unique selling points of the platform. At the time the product wasn't on the market yet. I created a few isometric charts from scratch to be used as visual indicators for the charting and big data aspect. These visuals we're combined with 4 sections summarising the core functions of the platform.